Our fourth major GTA update takes a look around the state of Los Santos and dips a toe in the water too. Plus - eyes-on coming next week! 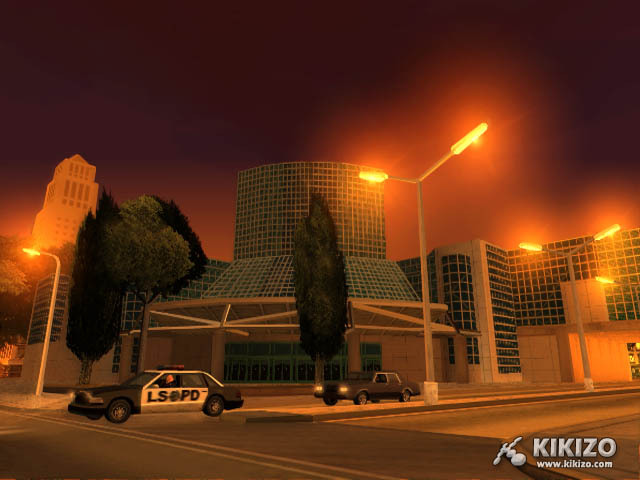 In the meantime, it's time to lear more about the places in Los Santos, the state that provides the setting for Rockstar's opus. 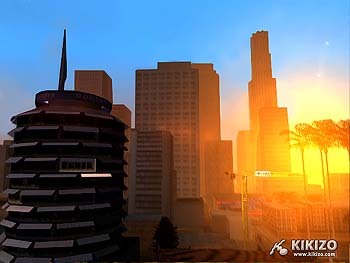 Building a city in San Andreas: A city is neither defined by its map, nor is it embodied simply by its people. It is a complex balance between the two. 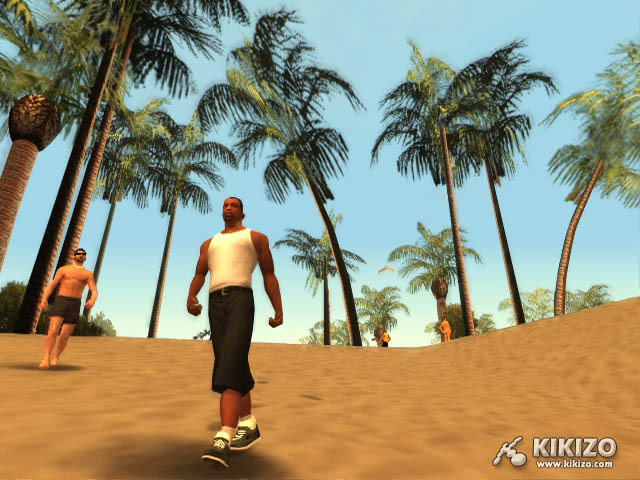 In Grand Theft Auto: San Andreas, the challenge to the designers was the greatest faced since the series went from 2D to 3D. Not to underplay it but Liberty City was a relatively small town; Vice City was a full city set in its own era; San Andreas is an entire state-living and breathing, filled with vibrant people and completely realized structures and infrastructure. 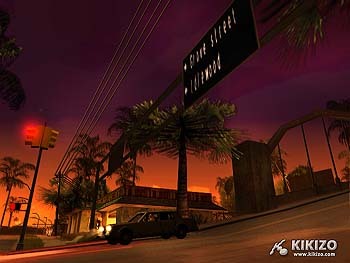 And like Vice City, the designers of San Andreas spent an enormous amount of time on translating the look and feel of actual places-Los Angeles, San Francisco, Las Vegas, and the countryside of both California and Nevada-into the fictitious world of San Andreas. The Grove: The center of CJ's universe is the cul-de-sac where he grew up, where his mom's house is and where all his friends live. 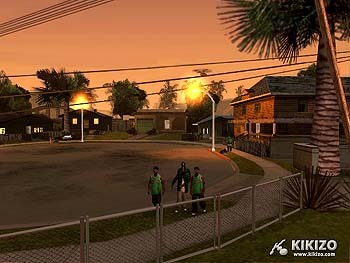 At the beginning of the game this is where CJ meets up with his old friends when he returns from Liberty City, and is one of the focal points throughout the storyline. He lived here with his younger brother and mother, both of whom are now dead and after moving back into his childhood home it's up to CJ to try and put together the pieces of what happened. It is the home turf for the Orange Grove Families, and CJ will spend a lot of time in his first days back taking control of the gang again running things out of this house. The neighborhood has seen a lot over the years and has obviously suffered some wear and tear in the process the result is a tight community that is not very welcoming to outsiders and is protective of their own. The Beach: Los Santos has several beautiful beaches. Need to cool down? Head out to the shore and go for a dip in the ocean; swimming is great exercise and the beach is always a good place for a morning run to build up your stamina - even go to the gym! The sand will slow you down, whether on foot, bicycle, or while driving a car. 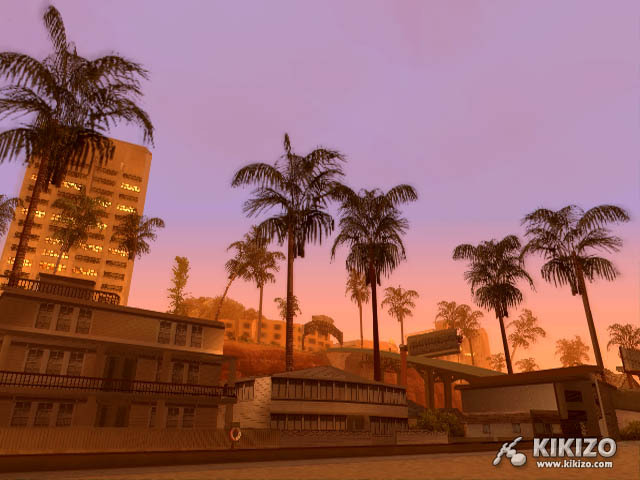 Despite its problems, Los Santos is still a popular tourist destination and the beaches are often crowded with sunbathers during the day. 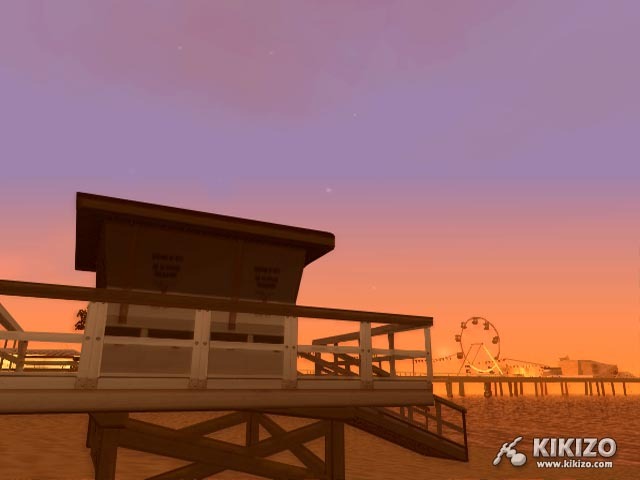 Head over to the Los Santos pier to catch a stunning sunset and wander around the pier's amusement park before heading back to the beach where you might see the occasional beach party happening late into the night. Had enough of the sand? Go for a stroll along Santa Maria Pier or walk along the boardwalk and check out the cheap souvenir shops and fast food street vendors. Vinewood: Known for its rock n' roll glamour and steeped in history the Vinewood strip in Los Santos is definitely not to be missed. A popular area for just cruising around, be sure to check out the streetside attractions that include some of the most outlandish buildings and characters in Los Santos - Cathay Theatre, Vinewood walk of fame, and the historical Vinewood sign, which sits high in the Vinewood hills overlooking the hazy streets below. 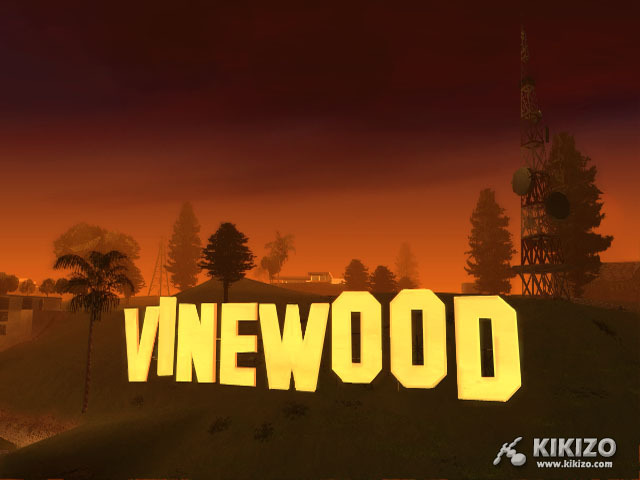 If trying to escape the tawdry, touristy bit of this area head deep within the Vinewood hills. Architecture buffs will drool over the residences found up here. Vinewood is a strange amalgamation where you'll see everything from millionaire mansions to vacant lots and old motels. It's the one place where eclecticism is welcomed. Rodeo: The perfect place to spend all your hard earned cash is Rodeo, the most exclusive and expensive shopping district in Los Santos. This is by far the most affluent neighborhood in the city, and the most ostentatious. 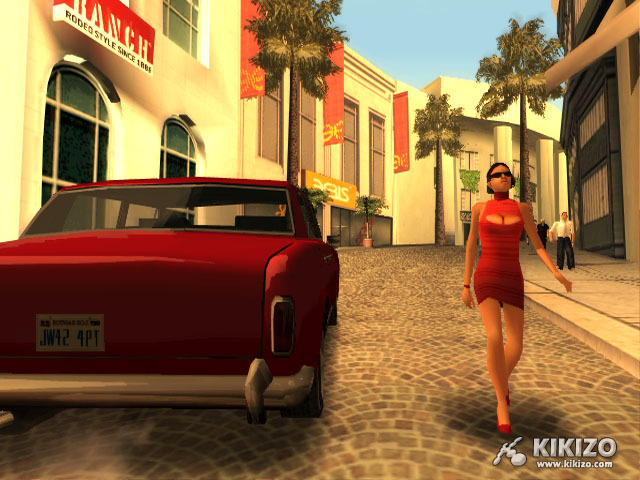 Similar to the extravagant suburbanism of Beverly Hills, the buildings are classic architectural styles, the streets seductively styled and here is where to find Los Santos' rich and beautiful people wandering about. Downtown Los Santos: Compared to other areas of Los Santos, downtown may seem like a ghost town. But this area is anything but dead- there are plenty of reasons to come to this part of Los Santos. This is the financial district of the city where you'll find businesses and office workers. Naturally the conference center is located here. From a distance the downtown area is a sight well worth looking out for - the hi-rise buildings rise tall from the haze of the city. Check out Doc G Records, inspired by the classic Capitol Records building! Be sure to look out for them when riding the Brown Streak railroad, which runs through these parts. 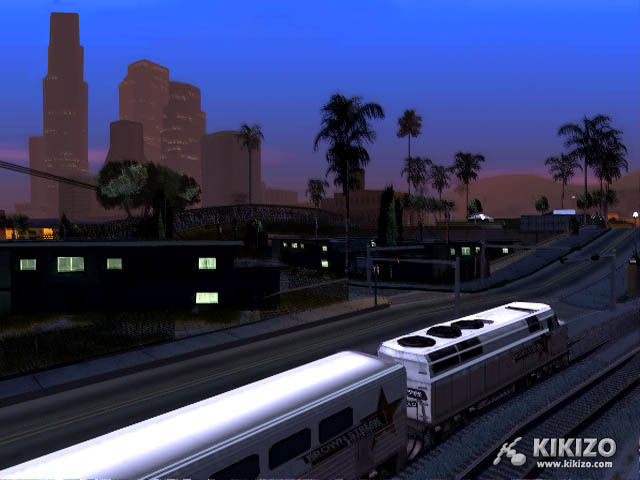 Simply hop on a train and get off wherever you please- the San Andreas rail network moves through all areas of Los Santos. Be careful you don't get in the way of one of these speeding bullets- they're fast and won't stop for anyone! It's extremely dangerous crossing the tracks- we recommend taking one of the overpasses above the tracks. The Freeways: Freeways, overpasses and intersections clearly shape the structure and look of Los Angeles. 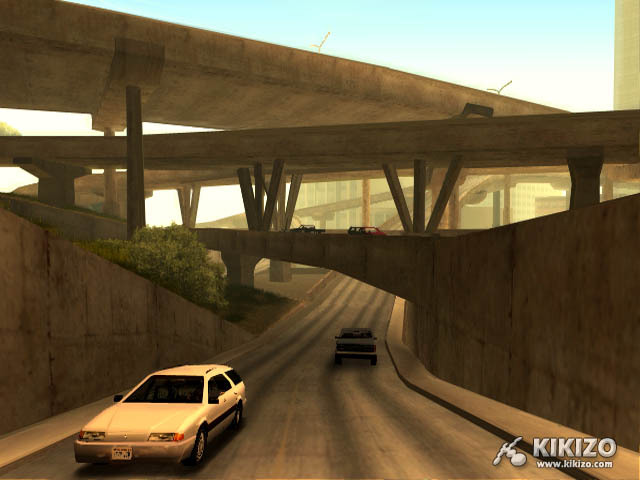 San Andreas is the ultimate driving state, and the multi-lane freeway snakes through it entirely, connecting Los Santos to San Fierro and Las Venturas, including all the points in between. The freeways are fast and convenient, sometimes taking local streets can add time to your trip, and some of the neighborhoods are just not safe to drive through. Thankfully, traffic never gets as bad in Los Santos as in the real LA! Street Signs: Need to get to Ocean Docks from Mullholland Intersection in a hurry? Trying to find your way to Downtown's Ammu-Nation to pick up some supplies for the night ahead? Luckily the street signs are clearly marked and conveniently placed around the city of Los Santos. Be sure to use them! In a city with as many neighborhoods as Los Santos you're sure to need these to navigate around. For the first time in the Grand Theft Auto series, the main character can now enjoy the freedom of the world's waterways outside the confines and comfort of a boat. It's now time to get you feet wet. 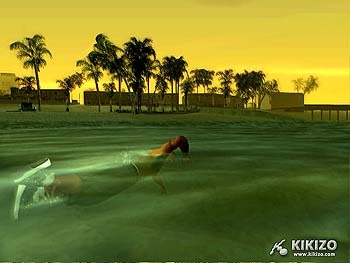 The ability to swim adds a whole new dimension to the gameplay in the Grand Theft Auto series. 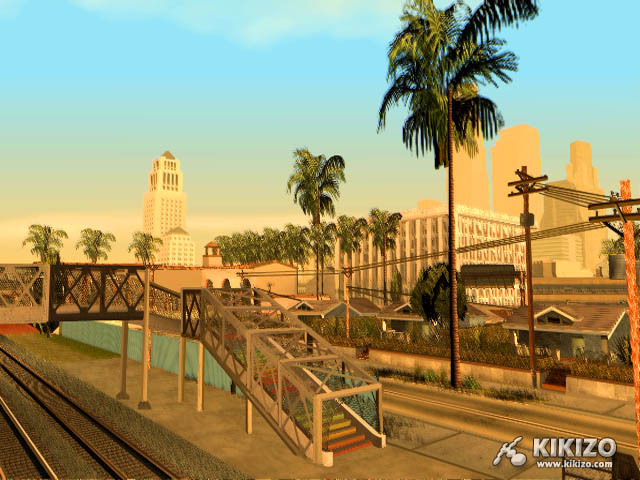 CJ now has the ability enjoy the oceans and rivers in the beautiful state of San Andreas. An ill-timed leap from a boat trying to get on a jetty? No problem. Need to jump off a bridge to avoid pursuers? No problem. Treading water: This is the default setting once CJ hits the water. He will automatically stay afloat, even in the roughest waters. Breast Stroke: Pushing forward on the left analogue stick will initiate the breaststroke. This is a slow and calm way of moving through the water and has no effect on CJs stamina. Freestyle: Holding down the X button allows CJ to swim in a faster, more proficient and accomplished manner. In a rush, or trying to escape the police, tap X to swim faster. However, swimming fast like this is tiring and CJ can only swim freestyle for so long. The more stamina you have the longer you will be able to do the front crawl. 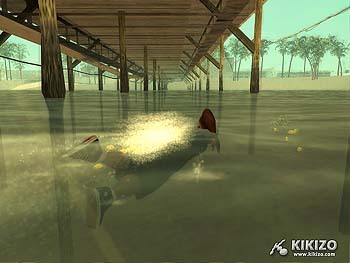 Underwater action: Pressing the O button will make CJ dive underneath the surface - an excellent way for CJ to avoid people on the surface who may be looking for him. Once underwater press X to swim around and observe the wonders of the San Andreas marine life. A word of warning, don't forget that CJ is human and a land mammal, he has lungs and cant breathe underwater or hold his breath indefinitely, keep an eye on his breath-o-meter. If this reaches zero then it's all over. You'll be swimming in a different kind of way... swimming with the fishes. Rockstar North have spent a good deal of time ensuring the underwater world of San Andreas is just as realistic as the rest of the landscape. In the event you happen to drive too fast on your PCJ and end up in the water, make sure you take the time to notice the details, like how vehicles will appear to warp slightly in the water. Lighting effects are naturally different underwater to on land and will change according to how deep underwater CJ is swimming. Closer to the surface, the lighting will change according to the weather and time of day above the water. 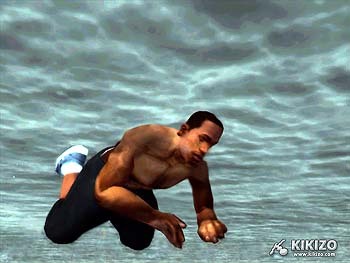 Also, when CJ is underwater and looks towards the surface, the objects there will appear differently to him. Knowing Rockstar North and their ability to always surprise us, it might be worthwhile keeping your eyes open for other interesting stuff hidden away below the surface! So, what happens if you drive your car off Santa Maria Pier? If CJ moves quickly he can escape from the car and swim to shore, but he will have a limited time to escape as he will begin to run out of breath as the car sinks, just as if he had dived underwater. Time to get out? CJ doesn't need special ramps or anything of that sort to get out of the water: he can get out at any beach and can grab onto any ledge, provided it's low enough for him to reach. Out at sea and tired of swimming? You can jack boats from within the water! Doing this on parked boats is easy: just climb aboard and takes control. It's harder to do on a moving boat, as it requires precise timing, but it is very satisfying! Grab onto the boat and - most of the time - pure intimidation works and the pilot will just take off and run off the edge of the boat in terror! Storm brewing: Technically, Rockstar North have completely reworked the wave physics. Now open water reacts even more realistically to different weather types, when it's stormy up near San Fierro, the water can get really rough! And boats react realistically to waves in the ocean; swells will slowly push a boat towards shore, and have more realistic wake effects. Never Swim Alone: CJ won't be the only one who can swim. Keep your eyes open for other folks enjoying the beaches of San Andreas! Click here for our original preview, update one, update two and update three.